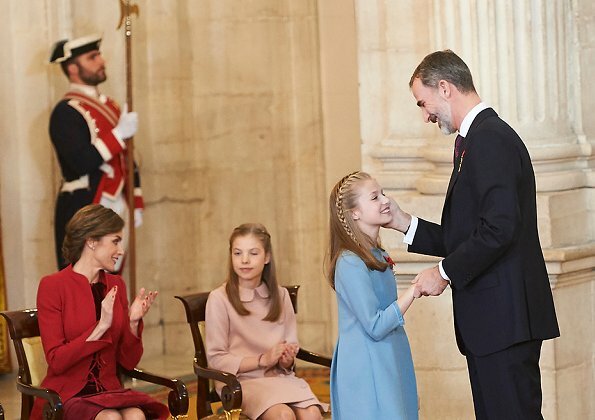 King Felipe of Spain presented Order of the Golden Fleece (Toison de Oro) to his daughter Crown Princess Leonor with a ceremony held at Madrid Royal Palace on January 30, 2018. Order of the Golden Fleece is the highest order in Spain and one of the most prestigious orders of Europe. 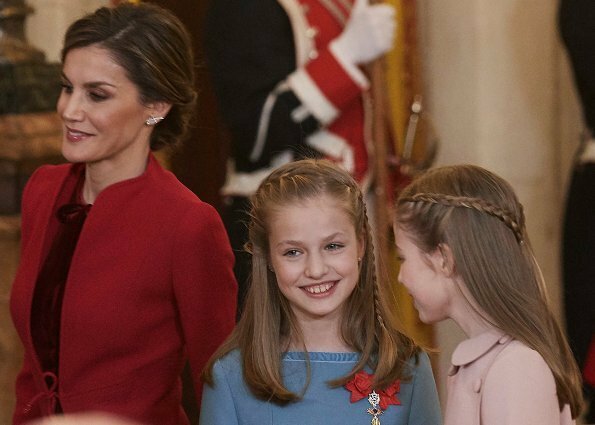 Queen Letizia, infanta Sofia, former King Juan Carlos of Spain and former Queen Sofia of Spain attended the ceremony. Today, King Felipe of Spaincelebrates his 50th birthday. She seems to be father´s princess in every way, how touching event really. It must be hard on Sofia to always play second fiddle to her sister, not here but in some photos, she even looks envious. This is just my opinion, but would it have been better not to publish such pics, she is just a child. I don't see any envy in Sofias face. I think that both girls grew up with this special constellation within their family and that their parents prepared each of them for her role. well, in the end we don't know. maybe it's hard for her, maybe she's happy to have a more normal life than her sister not so extremly in the focus.. 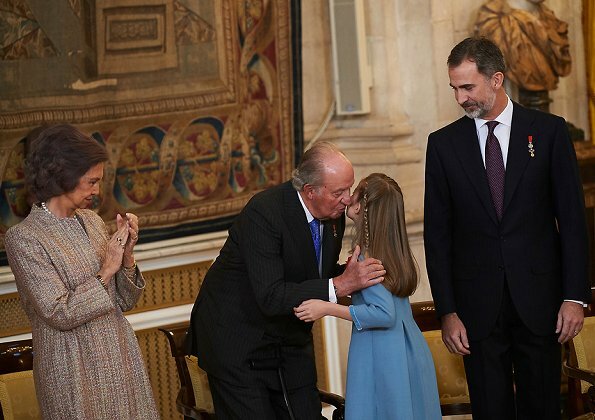 The pics are very nice especially the first is touching where the King holds Leonor's hand. 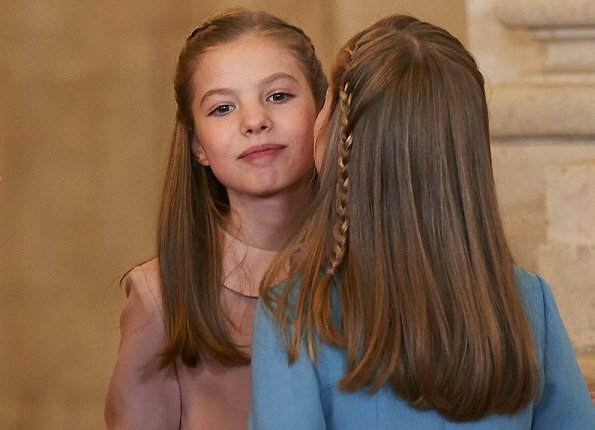 La Infanta Sofía adora a su hermana mayor y hoy se ha mostrado muy feliz por ella. En el futuro, ella tendrá una vida más fácil. Thank you Hellen for changing some pic. They are OK now. What a demonstration of privilege. Feudal society. that is why I am here. I for once do not want to see more pics of Mrs Elke Budenheimer or whatshername? I find your comment fascinating. If this is truly how you feel, then why are you clicking on a site that is patently celebrating what you apparently despise, and then you're taking the time to scroll through the pictures too! If the whole idea of monarchy is such an offense to you, then please don't visit this page and post comments that irritate those of us who do venerate these ancient institutions. I am sure there are better things for you to do with your precious time. Then why are you here? Everything here is...feudal. It is a blog for royalty. Why not just say nothing at all? I absolutely agree with Catchy, Alison and Diane. Athena, the internet is wide, perhaps you can find a blog an Marx and Lenin. Beautiful pictures, clothes as always "made by measure" for the Spanish Family. Picture perfect. "CatchTheScoop" should really know the name of the German President's wife, right? Quite respectless. ¡Qué comentario tan inteligente, Athena Smith! ¿Lo vas a repetir en cada Casa Real o solamente en la Española? Oh Coralie you have me roaring with laughter 🤣🤣🤣 omg that comment is brilliant hahahahaa "Marx or Lenin"
The order was created in the year 1430 by the Duke of Burgundy. 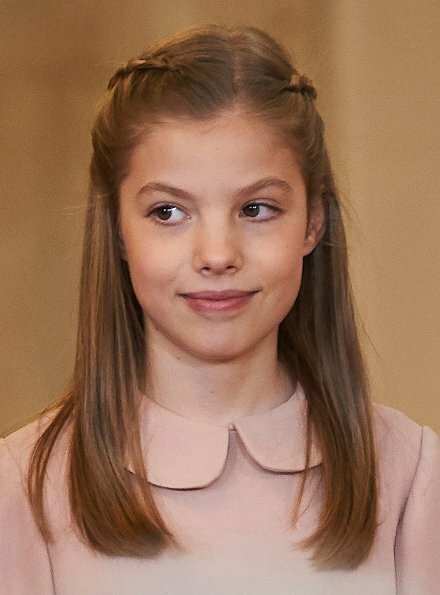 Three women are members of the Order, Queen Elizabeth, Queen Margaret, Queen Beatrix and now Princess Leonor is joining them. I very much hope that she will be a great Queen like them. To me, the ceremony is so beautiful and emotive, but, above all, represents a spiritual and cultural heritage, almost mystical. I agree - it was both majestic and yet intimate - the connection between father and daughter and also present King and Future Queen was touching. Agree Silvia. I suppose it's not east to understand for everybody. hmmm... I love leonor, but what exactly did she do to deserve such honor? I hope that at least the King honors Sofia too. RA the little ignorant troll of this site...she is the future Queen and no, Sofia won't get one. whatch it!! I never called names to anyone here !!! I was talking about equality bettwen the girls, NO NEED TO CALL PEOPLE NAMES !!! She has the same merits to be awarded this honor as prince William had when he was named Royal Knight Companion of the Most Noble Order of the Garter,and Knight of the Most Ancient and Most Noble Order of the Thistle. Were you also so belligerant about it at the time those honors were bestowed on prince William? Raquel, that is not how it works, one is the future queen and her sister is second in line. Royals are educated since birth to understand their roles, it comes with privileges and sacrifices, and like in real life not everybody gets a medal. Sakurahime, yes i also feel that about william. CB, the order us supposed to be given by merit. Like find the cure if a disease. Not become a monarch. Thats all very nice, but doesnt explain INSULTING PEOPLE. I love to see this family together. Thank you 👍 for this explanation, I dind´t know that either. The girls look always so well-behaved. In comparison to other girls at their age, who already look like little adults, they still seem very childlike. 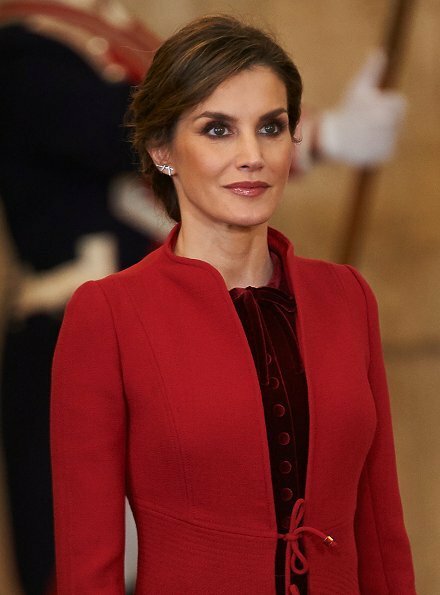 Queen LEtizia has the most wonderful make-up all the time. I deleted the last note I shall ever make here...waste of time, waste of space. I am used to open debate and sharing different opinions, that's not allowed here, so...Adios....dream on! exactly, someone just insult me on this post.... if you dont agree with some people here, they insult you and call you names ! Por mí puedes escribir lo que quieras, Raquel Alves, pero deberías plantearte por qué dudas de los méritos de la Princesa heredera de España al recibir el Toisón a los 12 años y NADA de los niños suecos que reciben al nacer un Ducado y la Orden de los Serafines sin ser ni herederos ni nada... Piénsalo. I agree with you Raquel. This blog would be very boring if we only read comments gushing over the monarchy and their clothes. Those commentators who insult others don’t seem to realise that many people do question privilege and there are are strong republican movements around. The royal families know this. Rather than resort to insults, it would be better to provide counter arguments. I, for one, believe good royal families play an important role in uniting their respective countries. However, people should be able to question any abuse of privilege,as happened with the sister and father of the King of Spain. Is not about questioning priviledge, is about NOT INSULT PEOPLE. Thats is considered a crime. I feel the same about all the royals that received similpar orders. Some people here insult others just cause they dont have the opinion. 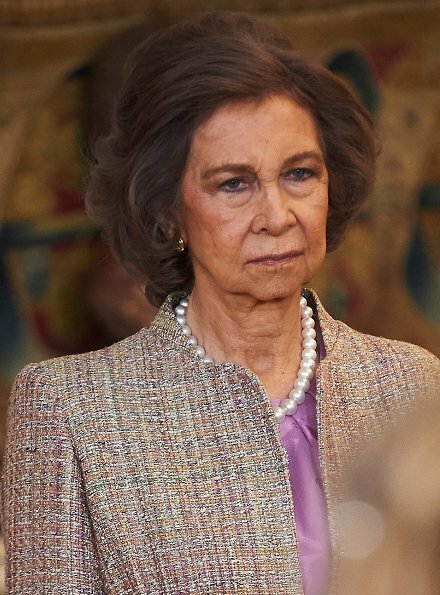 Lo siento, Christine Zafiris, pero este blog trata de eso: Ropa y moda de los Royals. Si eso te resulta aburrido, estoy segura de que encontrarás otros lugares para hablar de política, republicanismo o privilegios. No me gustan los insultos, pero que alguien diga que mi país es una "sociedad feudal" es indignante y me ofende. Lo dijo Athena Smith, todavía está ahí arriba. Yo no me he dirigido a ti, Raquel Alves. No obstante, es atrevido hablar de lo que se ignora. El Toisón de Oro no es una Orden de Mérito, Leonor la recibe por ser la Heredera. El Rey Felipe lo recibió a los 13 años y Juan Carlos cuando nació. No tiene nada que ver con la edad, sino con su condición de futura reina. Eso es todo. Ha sido una ceremonia sencilla, pero muy emotiva y llena de significado dinástico. 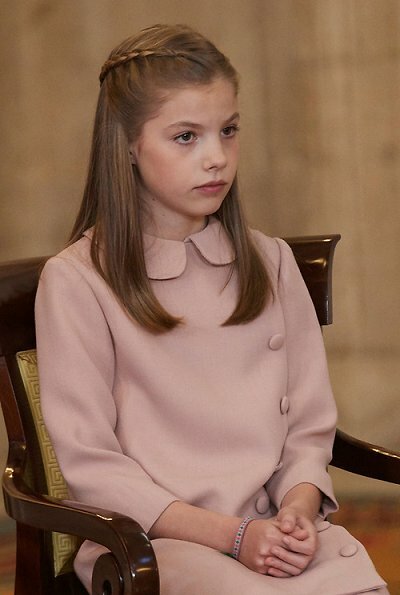 Leonor es una niña, pero ya es una Princesa perfecta. El Rey Felipe VI es un padre y esposo feliz. They appear to be sweet, unaffected girls who adore their parents. I have read how when they were younger the parents made sure to take pictures etc. of Sofia at occasions where Leonor's role made her stand out. The video shows Felipe to be devoted to all three of his girls. What a beautiful family! Happy 50th Birthday to King Felipe of Spain. Wow. I was in Madrid, Spain for a semester in 1982. The political science course about democracy was taught by one of the people who helped write the new Spanish Constitution. That year was an election year and there were over 15 political parties. It was democracy in its infancy, but it wasn't then nor is now, a feudal society. Infanta Sofia does not have to look further than her own grandmother Sofia to find someone who was born an arm's length away from the monarchy, yet not destined from birth. She has plenty of cousins/second cousins/etc. with whom to sympathize. 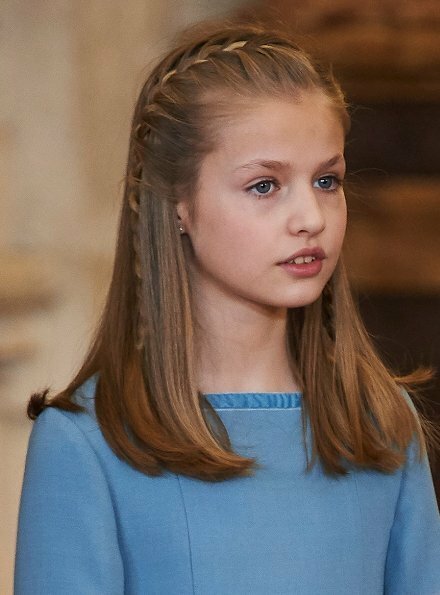 Further, I wouldn't be surprised if her parents raised her to understand that Leonor is going to need a confidante she can trust. Many of us know the best confidante of a female is often her sister.